The Feile for ladies commenced in 1994 in Kerry, which had only one division. Mayo hosted the 1995 and 1996 Feile. Leitrim in conjunction with Sligo and Roscommon hosted 2007 Feile. In 1995 two Mayo teams contested the final Carnacon and Kiltane, Carnacon won; they also contested the 1996 final but were runners-up to Beaufort of Kerry. St. Brendan's Ballygar of Galway won in 1998 and 2001. 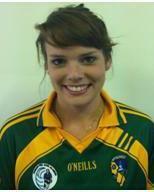 Corofin of Galway reached the Division 1 final of 2000 in Dublin but was beaten by South Kerry. Again in 2005 Corofin reached the final but were beaten by Foxrock Cabintely of Dublin. 2006 once again we had Corofin in the final against The Banner of Clare and The Banner took the title. 2010 and 2011Claregalway Co. Galway won Division 1 of National Feile Peil na nOg by beating St. Laurences Co. Kildare in 2010 and St. Vals of Cork in 2011. Division 2 was set up in 1996. Knock Claremorris contested this final but were beaten by Ballyboden St Endas of Dublin. 1997 St. Brendan's Ballygar of Galway beat Dungannon of Tyrone. Moy Davitts of Mayo won in 1999 by beating St. Patrick's, Co. Louth. Mayo had another winner in 2009 Kilmoremoy Ballina took the honours against Oldcastle of Meath. Feile Division 3 started in 1999 it took us until 2005 when Charlestown of Mayo reached the final. They disposed of St. Vincents of Louth in the Semi-final and St. Rhynaghs of Offaly in the final by 3-7 to 2-1. Division 4 started in 2004. St. Joseph's Aughavas of Leitrim todate are our only contesters in a final where Thomastown of Kilkenny beat them. We have two All Ireland Skills Champions 2000 Lisa O'Brien from Carnacon in Mayo and 2003 Therese Marron of Curry in Sligo. Our Counties that have won U-14 All Ireland Blitzes are. Division 1 Mayo in 1995 by beating Kerry and Galway in 2001 by beating Cavan, 2005 by beating Donegal. Mayo was runners-up in 1996 to Waterford. Galway was runners up in 1999 to Kerry, 2000, 2003 and 2006 to Cork. 2010 and 2011 Galway was runners up to Cork. Division 2 Sligo won in 2000 when they defeated Waterford. Mayo was runners-up in 1999 to Cork. Tyrone beat Roscommon in 2003. 2011 Leitrim were runners up to Tipperary. Division 3 Roscommon won in 2002 by defeating Clare. 2007 Roscommon overcame Wicklow in the final. Leitrim beat Offaly in 2008. Roscommon were beaten by Limerick in the 2006 final. 3rd Level Colleges Championship for the O'Connor Cup in 2000 Sligo IT beat Waterford IT. Sligo was beaten by Tralee IT in 1998. 2005 UCD beat NUI Galway 1 by 1-11 to 0-9. 2006 UCD again beat Sligo IT. Sligo IT were back again in the 2008 final to be beaten by DCU. The O'Connor Shield Division 1 in 2001 Sligo was beaten by QUB. NUI Galway beat UCD in the 2008 final. 2010 GMIT Castlebar Co. Mayo won the Colleges Lagan Cup Final by beating Carlow Institute for Further Education. 3rd Level Colleges Championship Division 2. Sligo RTC beat UCG in 1997. 1999 Castlebar IT was beaten by St. Patrick's College Drumcondra Dublin. GMIT in 2007 beat St. Marys Belfast and in 2008 Carlow IT beat GMIT. 3rd Level Colleges Championship for the Donaghy Cup Division 3. 2003 Castlebar were beaten by Dublin IT and in 2004 they were beaten by Limerick IT. 2005 NUI Galway 3rd team 3-8 beat UCC 2nd team in the final 1-6. GMIT in 2006 beat Cavan College. 3rd Level College Leagues Division 1 NUIG and Sligo were the only two college to play in finals in 2004 UCD beat NUIG and 2005 UL beat Sligo IT. 3rd Level College Leagues Division 2 in 1996 UCG were beaten by Dundalk RTC and 1997 Sligo RTC won by defeating UCG. Galway IT was defeated in 2001 by NUI Maynooth. 2011 Sligo IT won Division 2 Colleges League Final over NUI Maynooth. 3rd Level College Leagues Division 3 NUI Galways second team beat Dundalk IT in 2002. GMIT beat UUJ second team in 2006. Castlebar IT was beaten twice 1998 by Limerick IT and 2003 by Waterford IT second team. Limerick IT beat Galway IT in 2004. All Ireland Colleges Freshers 7 A Side Blitz. Blitz Championship NUI Galway contested two finals and were beaten in the two 2002 by UCD & 2003 by NUI Cork. Blitz Shield in 2006 GMIT suffered at the hands of UCC and NUIG went under to UCD in 2008. Blitz Plate NUIG in 2005 beat Trinity College. NUI Galway were beaten by Athlone IT in 2006 and by WIT in 2007. 3rd Level Colleges Interprovincial Championship for the Connacht Cup commenced in 2000 where Connacht won it first by defeating Ulster. 3rd Level Colleges Interprovincial Shield playing for the Leinster Shield was won twice by Connacht in 2001 and 2003 by defeating Ulster.